The Devin Gary Special was built in 1957 and it is very rare as one of only 20 Devin-bodied cars s with a certifiable race history (racingsportscars.com). The Gary Special was first raced in California, as a Triumph TR2 re-body, by Don McQuilken. It competed in 5 events during 1957. Then sold to Don Shaw of Ontario, Canada, and raced in 10 events as a TR3 re-body in 1959. A previous owner claimed two additional racing seasons at non-SCCA track Harewood Acres in Ontario during 1960- 61, but this has not yet been confirmed. Also claimed by previous owners is an appearance in the 1957 Los Angeles Concours d’Elegance; a dash plaque from that show is on the car. McQuilken raced in SCCA EM (E Modified). His best finish was 8th in class at San Diego on May 5, 1957. The cars original owner was its builder, James Gary, who sponsored Don McQuilken in 1957. 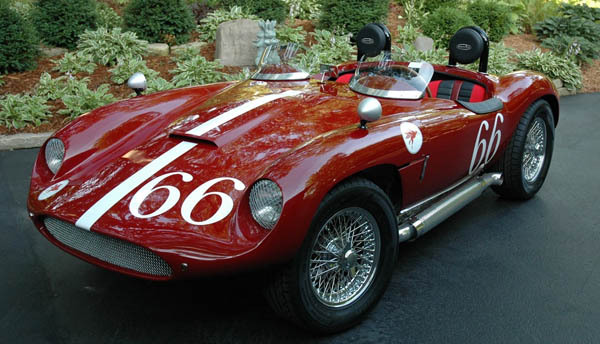 The car was constructed in late 1956/early 1957 with TR2 and TR3 components on a custom-modified frame. The engine was a TR2 unit. Shaw modified the car in 1958 and raced it in Canada as a Devin Special TR3 with a TR3 engine. Following Shaw’s ownership the car passed through several Canadian owners and then it was converted to the current race-engineered Buick (Rover) 215 cubic-inch, aluminum V-8. During this time, the car was believed to have been raced in Canada with Albatross Racing using the Buick engine. An American, Christopher Wright, then purchased the car and supervised a body-off restoration. During the restoration, Wright showed the car at the 2011 Detroit Autorama and, that same year, at the St. Johns Concours d’Elegance. According to Wright, the engine was completely rebuilt to original specifications with the exception that the compression ratio was lowered from 12.7:1 to 10:1 for road and rally use, and it produces an estimated 300 hp. The engine features Offenhauser aluminum intake and valve covers, and an Edelbrock carb.